When summer rolls around, your deck is the hero. It’s the time of the year where it is used the most, for parties, dinners, barbecues and sunbaking. This is an exciting time, but you need to make sure your deck is ready for the onslaught. So, use these tips to get your deck ready for the most important time of the year. Winter and spring is the wettest time of the year, and your deck may have been damaged by wild weather and moisture. Before worrying about anything else, you should check your deck for any rot or mould, as well as any loose planks or nails. Don’t just check the surface of your deck, try and get underneath it to check the frame and the joists. By doing this inspection, and carrying out any minor repairs, you can prevent any small issues from becoming big and potentially expensive problems. 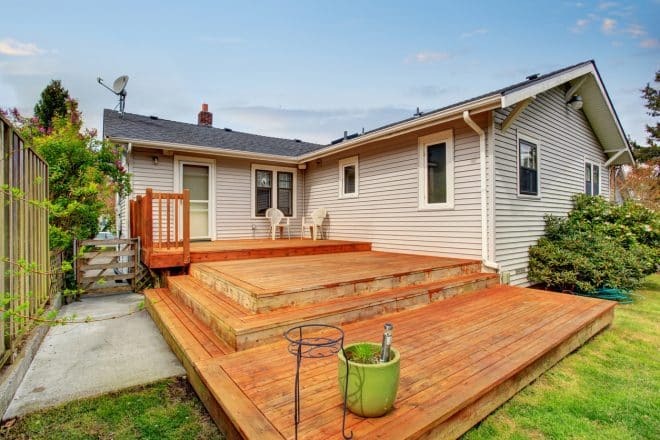 You want your deck to be in perfect condition for summer, and that means it should be clean. No one wants to spend an afternoon or night on your dirty, dusty deck, so find an appropriate cleanser and hire a pressure cleaner. Remember, the cleanser you use depends on the material of your deck. You wouldn’t use the same product for a composite deck as for a spotted gum deck. If you do use a pressure cleaner, you need to be careful not to hold the wand in one place for too long. If you apply too much water, you can damage the surface of the wood, which will encourage splitting and cracking later on. Nothing will protect your deck from the harsh sun, and everything else that will be thrown at it, like a stain and seal. Staining and sealing don’t have to alter the appearance of your deck, so if you want to preserve the rich brown of your Merbau deck or the natural variation of your Cumaru, opt for a clear wood stain and seal, which will protect against the elements and still allow your hardwood deck to shine. The most important thing you need to look for when choosing your stain is UV protection. Victoria has some of the strongest exposure to UV rays in the entire world, so your deck will have its work cut out for it in standing up under the sun. If you have any non-fixed furniture or other items on your deck, you should consider moving them around throughout summer. Areas that are exposed to the sun will naturally lose colour quicker than the areas that are either completely covered or under shade. If you keep items in the same space, it may be impossible to create a uniform colour, even after staining. We don’t tend to be as vigilant about keeping outdoor spaces clean when really, they need as much attention as your kitchen or lounge room. Cleaning your deck should become part of your weekly landscaping maintenance. Maintenance should include sweeping off any debris, such as leaves or dust. Leaving debris, particularly plant matter, on your decking can promote mould and mildew growth, especially after rain. There’s a fair chance that your BBQ is on your decking. During cooking and cleaning, all sorts of things can spill over your decking. The most significant enemies are oil and grease. If you allow either to settle on your deck, you can irreparably ruin the surface and create stains. It’s all about showing your deck the same respect as you would your kitchen floor. If something spills in the kitchen, you wipe it up immediately, so do the same with your deck. Of course, your deck will only look as good as the rest of your garden. If your garden is dragging down the beauty of your deck, why not do a full garden makeover before summer? Whether you need to pull some old, struggling plants and replace them with new ones, change the colour scheme of your flowers or plant some natives to cut your maintenance, now is the perfect time to do it. Follow these tips to look after your most important summer asset. The team at Everlast Services are always on hand for all of your decking and landscaping needs, so give us a call whenever you need some expert advice.